With the arrival of tempory generators and the fact that most of the island is on holiday for much of August, there has be an improvement in the power supply situation. Since the beginning of August there have been few power cuts at weekends. Since mid-August the number of power cuts has reduced with many days not have one at all. Additional navigation is now gradually being added to the website. This is in the form of "breadcrumb" links on the right hand side just below the top menu. These "breadcrumbs" show the links that lead up to the current page. This new feature should be especially useful for those visitors who come direct from a search engine to a grave detail page. If a family name search is unsuccessful, the webpage now displays all the family names held within the GPR database starting with the same first two letters. At 6am on Monday 11th July 2011 a catastrofic explosion occurred at the Cypriot Evangelos Florakis Naval Base. The explosion happened when a bush fire reached an explosives dump and killed thirteen and injured over forty. The explosives had been stored at the base since 2009 when they were confiscated from the vessel Monchegorsk because it was in breach of the UN Security Council Resolution 1747. The explosion was felt thirty miles away at the home of Charles Sale who runs the GPR. It is reported to have been the largest civil explosion ever. Although it damaged much property in the surrounding area, the worst distruction was at the nearby Vassilikos powerstation which was virtually destroyed. It has been stated that two billion euros will be needed to rebuild the powerstation and that it will take at least a year. Because Vassilikos supplied 50% of Cyprus' electric supply, the damage has had a tremendous impact on the whole country with power cuts every day. There is at least one power cut each day that lasts for just over two hours but sometimes there have been as many as five lasting nine hours. This loss of power has had a disrupting effect on GPR and has meant that fewer new cemeteries have been added this month. The GPR now has a few of volunteers in France. One volunteer has now started to photograph and index the extremely interesting cemetery at Montmartre, Paris. This cemetery is amazing not only for its stunning monuments but also because it contains the remains of many very famous people. As part of the Montmartre project, the GPR is hoping to add a new feature to the website: biographical notes. At present this has not been implemented but once they start to become available the new feature will also be available. Extra information about cemeteries,when available, is now being displayed on the cemetery pages.. Extra information about people mentioned on a grave monument can now be added to the GPR database. At present this can only be done immediately after requesting an image. When it is available, extra information is now displayed on grave information pages. The cemetery details pages have now been updated so that if a postcode is held within the database for a cemetery then a Google location map for the cemetery will be displayed. The cemetery records are gradually being updated with postcodes to take advantage of this new feature. You can see how it works by looking at the Dean Cemetery page. Currently this only works for UK postcodes. The new WC3 HTML 4.01 (strict) compliant version of the GPR website is now live! There is now a new improved version of the comments system. There is now a new improved version of the GPR links database system. Some new features are being developed to allow visitors to the GPR website to upload a variety of information. These new features will al have additional feature to help to stop hackers uploading inappropriate material. They should be live in July. A major re-write of the website has started to make it WC3 HTML 4.01 (strict) compliant. Thsi work should be completed by mid June 2011. The way cities/towns and villages details are stored within the GPR database has now been modified to allow villages to have more than one cemetery! This extra information, when it is available, will be displayed on the cemetery pages. If the geo-location is available then a Google map will show the location of the cemetery. 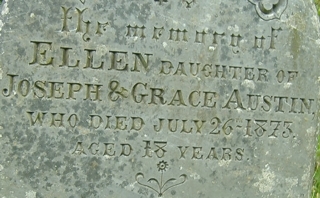 This extra information, when it is available, will be displayed on the individual grave pages. If the geo-location is available then a Google map will show the location of the grave.